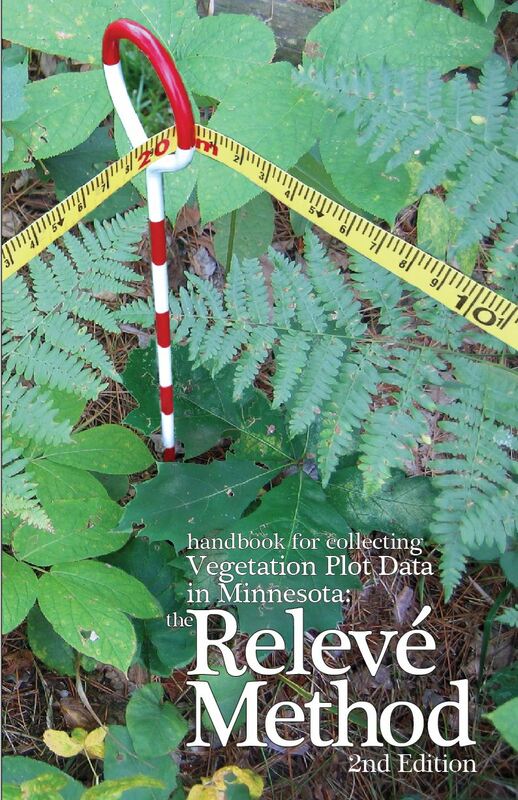 A Handbook for Collecting Vegetation Plot Data in Minnesota: The Relevé Method (2nd Edition) describes the current practices of DNR plant ecologists for collection of vegetation plot data using the relevé method. Relevés have been widely used in Europe for vegetation description and classification and increasingly are being adopted for vegetation study in North America. The DNR maintains a database containing electronic versions of relevés and other very similar kinds of vegetation plot data collected across Minnesota beginning in the 1960s. This handbook supplants the first handbook describing the methods DNR plant ecologists use for collecting relevé plot data, A Handbook for Collecting Relevé Data in Minnesota, which was compiled by J. C. Almendinger in 1987. Documents below revised June 21, 2013. Booklet Version (7mb). Formatted to print double-sided, horizontally on 8.5" x 11" paper, fold in half, and staple along the spine to make a 5.5" x 8.5" booklet. For best printing results, save pdf file to your computer before printing. Single-Page Version (8.5mb). Formatted for accessible electronic viewing and one page-per-sheet printing. We would appreciate any comments or editorial suggestions on the relevé handbook. Please send them to [email protected]. Minnesota DNR's Relevé Field Form is the current form used by the DNR for recording relevé plot data in the field. The handbook linked above has field-by-field instructions for completing the relevé form. Two-Column Version Provides space for recording up to 80 plant species; formatted to print on 8.5" x 11" paper, one page per sheet. Three-Column Version Provides space for recording up to 126 plant species; formatted to print on 8.5" x 11" paper, one page per sheet. Minnesota's Native Plant Communities provides a brief overview of native plant communities in Minnesota and of the DNR's current native plant community classification (Version 2.0), along with electronic versions of fact sheets from the DNR's field guides to native plant communities (below). Version 2.0 of the DNR's native plant community classification is based on extensive analysis of vegetation plot data from across Minnesota and replaces the community classification described in Minnesota's Native Vegetation: A Key to Natural Communities (Version 1.5) . The previous version (1.5) of the classification was based on the collective field experience of DNR plant ecologists, supplemented by published vegetation studies, and is now mainly of historic interest. Minnesota's Ecological Classification System describes the DNR's ecological land classification system, a hierarchical system for classifying land into nested, progressively smaller and more ecologically uniform units. These units range from broad ecological provinces, defined by major climate zones, native vegetation, and biomes, to land type phases, which are local units characterized by unique associations of understory plants, soil types, and topography. The DNR's current native plant community classification is integrated with the upper levels of this ecological land classification system. The MNTaxa Vascular Plants of Minnesota is a list of all vascular plant species documented in Minnesota, with scientific name, common name, and native versus non-native status. This list is generated from a database that incorporates recent changes in plant taxonomy. MNTaxa Vascular Plants of Minnesota is the Minnesota DNR standard for plant taxonomy and is periodically updated. Minnesota's Bearing Tree Database describes the DNR's database of the bearing-tree records collected in Minnesota by public land surveyors. This report provides information on the use of these data for study of the vegetation present in Minnesota at the time of the Public Land Surveys (1847—1908).